So many goodies for you! I have the pleasure of being one of the first featured authors on the 12 Days of Christmas, which is hosted by Readings and Things. Catarina has been an amazing blogger to work with as I launched Bound by Duty, and she is part of the Rebel squad that supports Rachel Higginson, who you guys know I love. I knew as soon as she contacted me that I wanted in on this! Part of my duties in being featured was to answer a holiday-themed question. My question is – What gets me in the holiday spirit? Hmmmm…I’m typically a late-bloomer when it comes to getting into Christmas. I totally make fun of people who turn their lights on before Thanksgiving, and I don’t want to listen to Christmas music until at least Dec. 1, if not later. It’s usually about Dec. 15 when I really get into it. By that point, most of the stress of the month is gone. The house is decorated, the presents are mostly bought, my grad school semester is over and I’m counting down the days until my annual holiday break (I take from Christmas through New Year’s off work every year). But what really gets me in the holiday spirit is my yearly tradition of making an ornament with my husband. We go wander around Michaels together and bring each other random objects or ideas for what to do that year. We’ve been making ornaments for ten years and this year, and I hope to someday have a tree filled with our memories. We have our supplies, but haven’t had the chance to actually make the 2014 ornament. Hopefully that happens this weekend! The 12 Days of Christmas event also means I’ll be taking over the Facebook event page for an hour tonight. From 6 – 7 p.m. (Central time) I will be chatting with whoever is online, doing some giveaways and having tons of fun. You should join the event and come hang out! Now…on to the really fun part of being featured! All the extras I have for you – can I get a “woot, woot”? (I’m close to being delirious guys, stick with me). The official Bound by Spells synopsis! Amelia made the decision to stand by the duty her mother gave her before she died, which included walking away from her first chance at love. Trapped in Cresthaven at the Queen’s mercy, she spends her days with Micah — an ally she still holds at arm’s length — struggling to manage her heartbreak while keeping her mind focused on the task at hand. As she continues to unlock the secrets of the Keeper power, Queen Julia’s true motives reveal themselves, forcing Amelia to decide, yet again, how much she’s willing to sacrifice. It’s just a little guy, because really, if I keep giving you guys long teasers you’re just going to have the whole book. So, savor it. 😉 Also, I’m in editing madness, so this is subject to change. What felt like seconds later I was awake, but not really. I was dreaming. I was back in the forest that had haunted my dreams for months, the fog sweeping through and feeling alone. I was at least still on two legs, which was different than the last time I’d been here after I brought Bethany home from the AniMages. Oh, how long ago that seemed. It was hard to believe it had only been weeks since I truly started to understand who I was and what was inside me. I was lost in my own head as I pushed through the trees. I wasn’t scared, I had been here so many times before. The trees that closed around me had become friends. Their leaves slid through my fingers as I wandered around and their bark scraped the pads as I grazed them along the trunks. I felt safe here. For the first time in weeks I truly felt safe. As I turned to head a new direction, the brush rustled and I could feel the vibration of something coming toward me. Every hair on the back of my neck stood up as I realized that I truly wasn’t alone. For the first time, someone or something was here with me. I looked around, trying to decide if I could run and which way made the most sense. I searched inside me and found only my small violet flame. The Keeper was nowhere to be found and I was unsure of how much power I held without her. I went to take my first running step when it burst through the trees. I was flat on my back before I could even gasp for the breath that had been knocked out of me. Two paws dug into my chest and a snarling lip curled around pointed teeth. I still wasn’t breathing as my eyes traveled up and connected to brilliant sapphires I would know anywhere. I saw recognition flit through his eyes and the growling slowed to a low whine as Aidan stepped off and back from me. 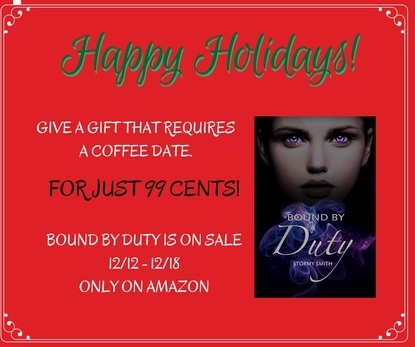 And… guess what, Bound by Duty is ON SALE! Because I want to reward my awesome readers, I will be posting a contest on my Facebook page around 8 a.m. that will ask you to do two things. 1) Tell me what you think Charlie is, or should be? 2) Gift Bound by Duty to a friend you think will love it. Do number 1 and you get one entry in the contest. Do number 2 and you get three entries in the contest. What do you win, you ask? 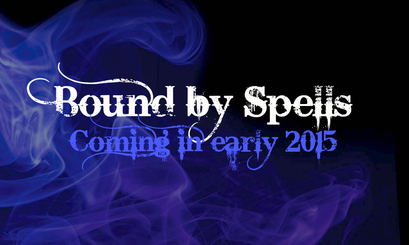 You get to be a beta reader for Bound by Spells! I know, I buried the lead. But, it was fun. So, that’s all! You know my holiday secrets, you got the synopsis and a teaser, and now you have a chance to be a beta reader for BBS. It’s a big day, kids. Enjoy your weekend, I’m going to finish out this work day and spend my weekend editing!